About a month into my college career, my parents visited for a hike in the New England woods. I had recently settled on becoming a geology major, which was an outlandish choice in contrast to the long line of engineering majors in the family. My dad pointed to the nearest boulder along the trail. “What’s that?” he quizzed. The boulder was a swirled blend of white, pink, and sparkly grey. “That’s gneiss,” I replied, trying to sound well-informed. 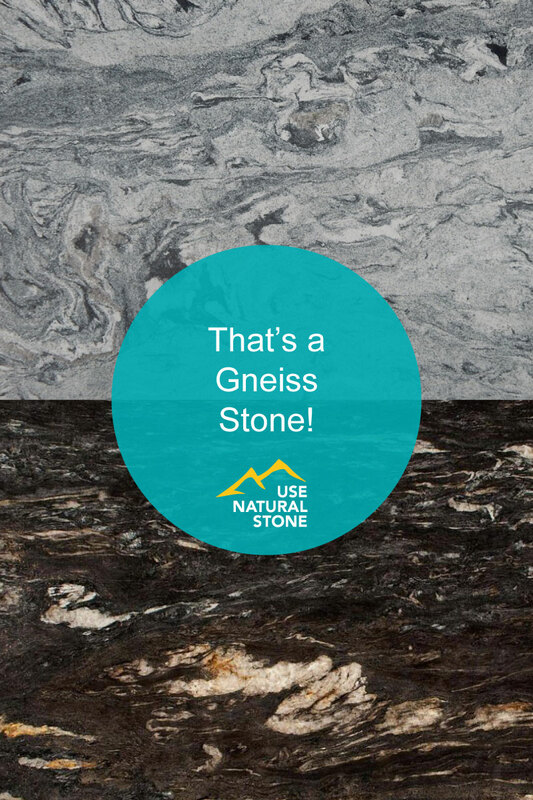 Gneiss is among the most common commercial stones, but you may not have heard of gneiss because it’s almost always classified as granite. Geologically speaking, granite and gneiss are similar, so lumping them together is a reasonable thing to do. In simplified terms, you can think of gneiss as a metamorphic version of granite. Both gneiss and granite are made of feldspars, quartz, mica, and smaller amounts of dark colored minerals like hornblende. Both have tightly interlocking minerals, so they are minimally porous. On paper, they have similar properties and can be used in the same ways. 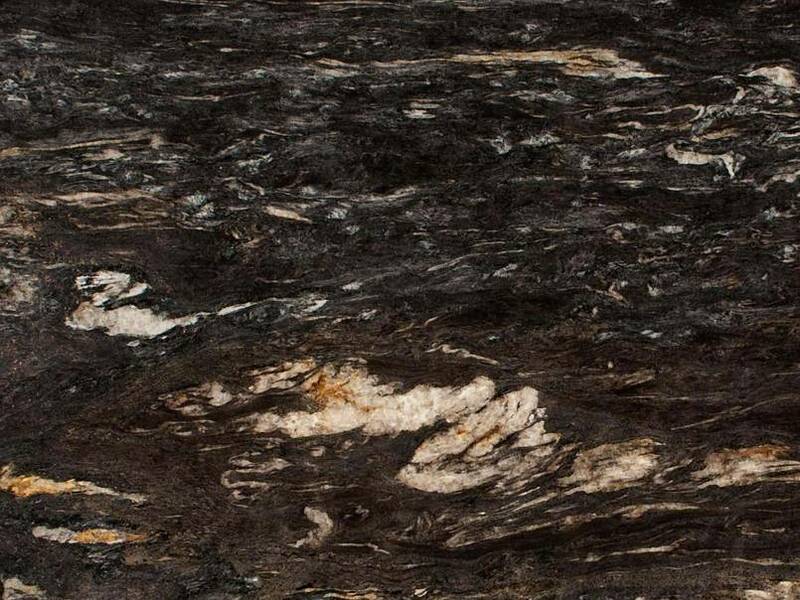 The difference between granite and gneiss is in their overall texture and movement. Granite is evenly speckled. 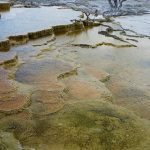 It formed from liquid magma that cooled and crystallized. 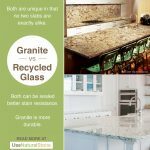 Granite is like rocky road ice cream – a solidified conglomeration of different ingredients. Viscount White. Photo courtesy of Arizona Tile. Gneiss, arguably, is more visually interesting. It’s characterized by stripes, linear bands, or flowy rivers of color. This pattern is called foliation and it’s a result of the rock being squeezed and heated. Gneiss is like ribbon candy – it’s been folded and swirled while hot, and then left to harden. The stone captures the expressiveness and movement that come from its dynamic origins. The striped, wavy look of gneiss comes from extreme amounts of compression. The random orientation of minerals you see in granite is an inefficient use of space, sort of like the ragtag pile of magazines you left next to the couch. Those magazines take up less space if you stack them all the same way, right? This principle applies to minerals too. They align themselves in the same direction when they get buried a few miles deep and pressed between colliding continents. If the pressure on the stone is evenly distributed, you get straight or gently flowing stripes, like Agatha Black or Viscount White. If the compression involves folding or twisting, as it often does in geologic crumple zones, then you get a stone with wavy or ribbonlike texture. Amadeus and Black Forest are examples of gneisses with dynamic textures. All metamorphic rocks have a ‘parent rock,’ which is a rather sweet way of describing what the stone was before it encountered the heat and pressure that transformed it into a metamorphic rock. The parent rock of gneiss can be granite, but it can also be shale or an impure sandstone (meaning it contains more than just pure quartz sand). Previous articles have described the continuum of metamorphism as a stone is exposed to increasingly torturous heating and compression. Shale becomes slate, then phyllite, then schist, then gneiss. Each of these steps is gradual, as the stone slowly changes in response to the conditions it experiences. Regardless of its geologic parent rock, gneiss is near the end of the metamorphic road. Heat it further and it begins to melt. When it starts to melt, it doesn’t do so at once. The mineral quartz will melt first. Another delicious food analogy applies here. The beginning of the melting process is just like a chocolate chip cookie left in a warm car. The chocolate chips will melt long before the rest of the cookie does. In gneiss, you can often see fluid-looking pockets of quartz that were melted while the rest of the rock remained solid. A gneiss that was partway melted is called migmatite, which means “mixed rock.” Part metamorphic, part igneous. Examples of migmatite are Titanium, Cosmic Black, and Tropical Black. Gneiss is one of the most common rocks on Earth’s surface. It forms the “basement rocks” that are below most land masses. These basement rocks are over a billion years old and, just like the basement of your house, they are the foundation for the layers above. Newer stones pile up on top of the basement. But sometimes those newer layers get scraped away by erosion, and the older layers get heaved upward by mountain building. Behold, the basement sticks out at the surface. I like how gneiss offers a glimpse of what went on in the depths of Earth’s crust; the flowing swirls of color reveal how the whole rock was once fluid and bendable. 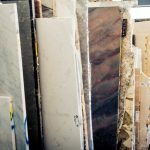 One of the fun things about natural stone is the huge range of aesthetics that are expressed in stone. 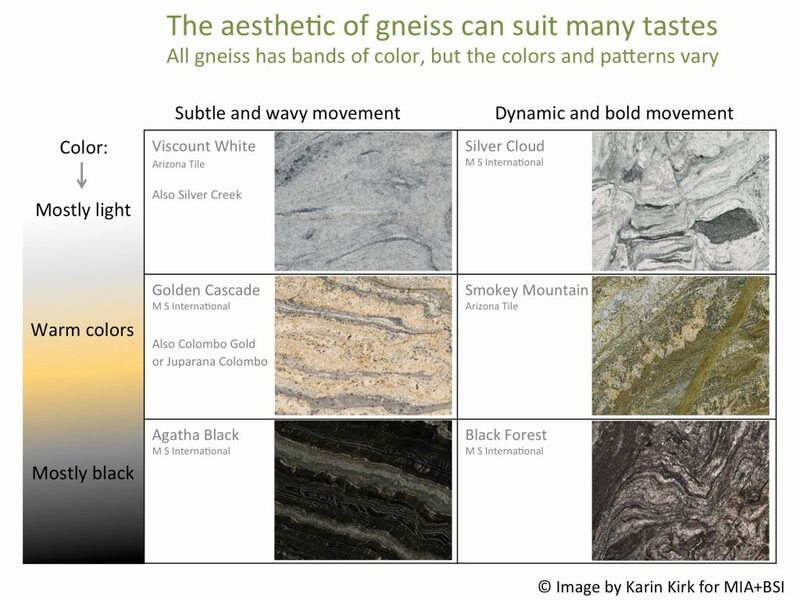 Gneiss is no exception; it comes in many variations, and can appeal to many different styles and tastes. While all gneiss is striped or banded, the bands can be straight, gently wavy, or chaotic. The colors can be mostly dark, or mostly light. The stone can be black and white, or black and pink, or black and gold, or nearly any combination thereof. Interesting minerals like garnets (dark pink, round specks) or kyanite (blue, elongated crystals) can liven up the usual combo of minerals. Note that a stone of a given name can have different patterns depending on which direction it is cut and which part of the quarry it is from. Viscount White, for example, can be serene or vivid. 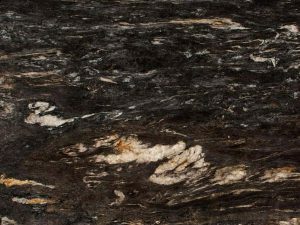 When shopping for gneiss, it’s helpful to select specific slabs to get the look you want. Gneiss is a terrific stone for many purposes. It tends to be blocky and dense, and makes robust dimension stone for buildings, walls, and landscaping. 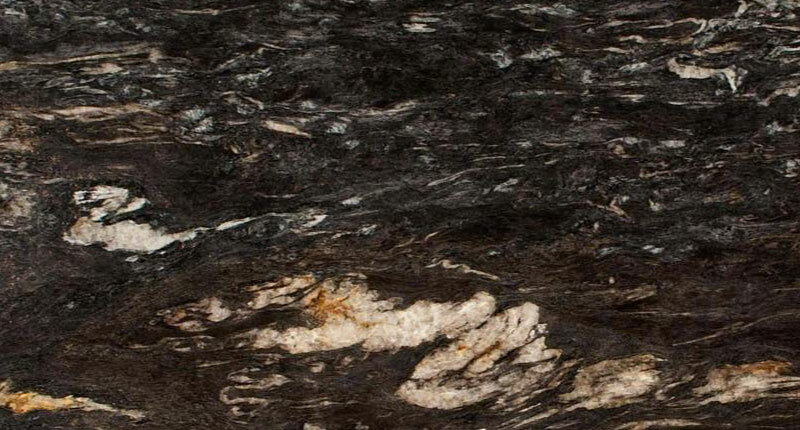 Gneiss is also a durable choice for interior uses, and makes a fantastic countertop or tile. The minerals in gneiss do not etch when exposed to normal household acids like vinegar or citrus. Take comfort in knowing that gneiss can withstand heavy use; it is made up of minerals in the 6-7 range on Mohs scale, meaning it’s harder than glass and about the same hardness as steel. It tends to be low in porosity, meaning it is not likely to stain, but there is some variability here, and some gneisses benefit from sealing. There are two caveats when working with gneiss. One is that the linear grain in the stone can sometimes mean that the stone wants to split along those layers. This is not common, but worth considering if you have a large overhang. Try to minimize overhanging areas where the overhang is parallel with the natural grain of the stone. Or, if you do use the stone this way, be sure it’s well-supported underneath. Second, keep an eye out for large areas of mica minerals, which are readily identified by their glittery look. In gneiss, mica minerals tend to form their own layers, which are likely weaker areas than the surrounding feldspar and quartz. Some of the dark colored gneisses have large amounts of biotite mica. Learn more in the article about schist. All in all, gneiss is a durable, functional stone with a pleasing range of aesthetics. 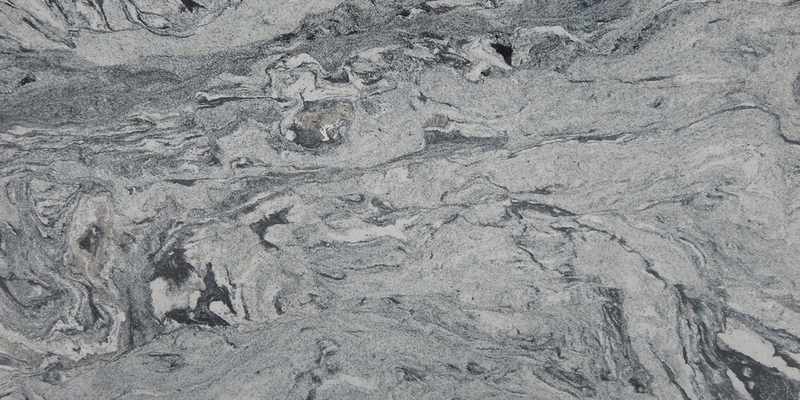 If you crave a rock-solid building stone or a countertop with flow and personality, check out a nice piece of gneiss.